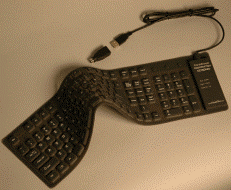 The Virtually Indestructible Keyboard, a silicone-based flexible computer keyboard, features a unique combination of durability and soft, comfortable feel. The washable, “roll-able” keyboard has been called “the best thing to happen to typing since the backspace key.”The Keyboard combines state-of-the-art technology with practical design to produce the perfect keyboard. The unique layout offers quick, reflexive typing action that is not only silent, but also more comfortable than standard hard plastic keyboards. The “flat-out” design eliminates negative-angle wrist stress, an unfortunate and impractical holdover from the archaic days of manual typewriters. The silicon-based material is impervious to most anything including water, coffee and cleaning solutions. From the classroom to the factory floor, this virtually indestructible keyboard is poised to revolutionize how the world types. “Glow-Type” edition is popular in operating rooms and patient rooms when ambient light is at a minimum. including detergent and hot water. * Disinfect with standard aerosols between shifts.